Following in the footsteps of George Washington—who took the unprecedented step of removing himself from the U.S. presidency after just two super-dumb, terrorist-themed action movies—Aaron Eckhart has announced that he won’t be reprising his role as frequently bedeviled head of state Benjamin Asher in the upcoming Angel Has Fallen. 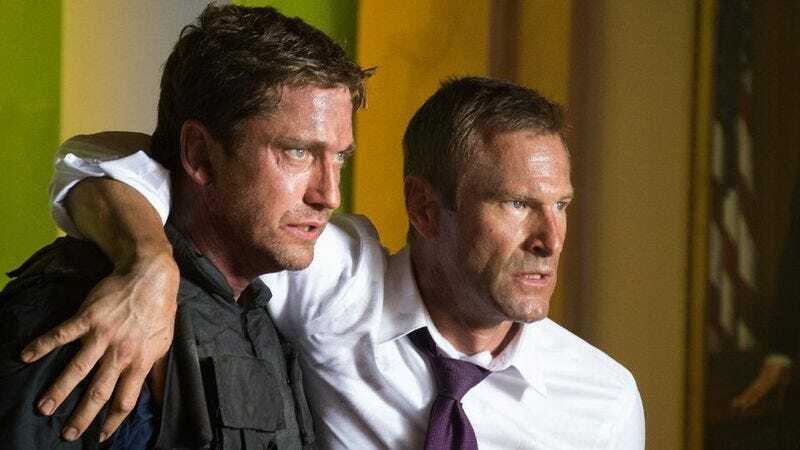 Eckhart played the fictitious president in both 2013’s Olympus Has Fallen and its sequel, London Has Falling, dodging gunfire and finding new and interesting ways to place Gerard Butler in between explosions and himself. But no more: according to Eckhart, who was promoting his new boxing movie, Bleed For This, with Collider, “The President is retired. He’s golfing and he’s amassing his library right now.” He’s also, presumably, expressing some relief that the bad guys are going after Butler’s Secret Service super agent Mike Banning for once, instead of him, with the new movie’s plot centered on an attempt to kill Banning while he’s flying on “Angel,” a.k.a. Air Force One.